A concept that was revealed in 2003 became a reality in 2006 when the Clemson University International Center for Automotive Research (CU-ICAR) opened in Greenville. The 250-acre campus includes five state-of-the art buildings, four of which are LEED-certified (Leadership in Energy and Environmental Design). A sixth building is presently in the planning stages. The research center offers master’s and doctoral degrees in automotive engineering, and in December of 2009 CU-ICAR awarded the nation’s first Ph.D. in the field. Three years later the first woman in the nation to earn a Ph.D. in automotive engineering graduated from CU-ICAR. While the center is a department of Clemson University, it also enjoys support from private partnerships with BMW – which has a research and development facility on the campus – Michelin, AT&T, Sun Microsystems, and Timken, among others. Today the center hosts 200 students in seven areas: advanced powertrain systems; automotive systems integration; human factors; manufacturing and materials; vehicle performance; vehicle-to-vehicle connectivity and vehicle-infrastructure integration; and vehicular electronics. Pictured above is the Koyo/JTEKT Group building, also known as the Collaboration 3 building. Completed in 2006, it was the first LEED Gold-CS (Core and Shell) certified building in the state of South Carolina and the second LEED-certified building in Greenville County. It is used for research and development, laboratories, and offices. The jewel of the campus is the Carroll A. Campbell Graduate Engineering Center, built in 2005. The 90,000 square-foot building is LEED-NC (New Construction) Silver certified, a grade higher than initial LEED certification. During its construction, over 75% of all building material waste was recycled, including concrete, asphalt, paper, metal and cardboard. Overall, more than 1,820 tons of construction waste were recycled. The building houses the graduate program and systems integration research as well as faculty offices. The BMW Information Technology Research Center is the only non-LEED certified building on campus; however, it is Wildlife and Industry Together (W.A.I.T.) certified by the South Carolina Wildlife Federation. The W.A.I.T. certification means that wildlife habitat needs were integrated with corporate needs during the building’s construction. The building includes a wildlife viewing area, nature trails, and a garden. CU-ICAR’s remaining two buildings are the Center for Emerging Technologies, which also supports research and development, and Innovation Place, a campus amenities center. 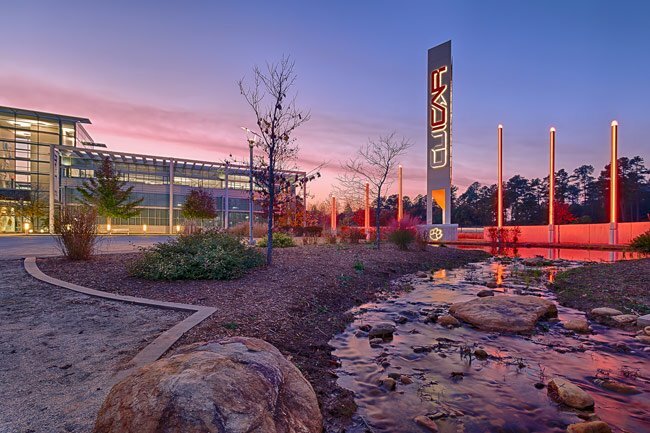 Both are LEED-certified, with the Center for Emerging Technologies earning LEED-CS certification and Innovation Place receiving LEED-NC Gold certification.